Before the building of the House of labour, it was old wooden house, which was purchased by the landowner Bugrov. He built on the site of an old house new, three-storey stone apartment house. On the first floor there was a shop, one was given to the municipal theatre, which has been left without an office because of the fire. To the word, the things of the theatre were bad, rent charge was not made on time, and Bugrov demanded the eviction of the theater, which after his death was again called in to the house. Grandson Bugrov, Nikolai, would not that be in the house of his grandfather housed the theatre and donated for the construction of a building for the theatre to 200 thousand roubles, but after he bought himself a house, and then passed it to the gratuitous use of the Municipal Duma. In 1898, plans Duma was the opening of shops on the ground floor of the building, and the library on the second, but during repair, the fire broke out and the building was completely burned to the ground. In 1902 by architect Zeidler was built a new building, in 1904 completed the finishing of interiors. 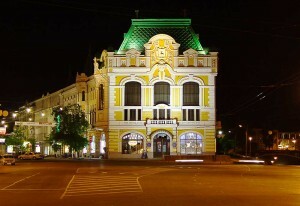 The facades are decorated in the Russian style in the interior there are features of modern style. A large part of the construction costs assumed Nikolai Bugrov. Since the building of the new building, it housed the City hall, after the February revolution there was a Temporary Council of workers ‘ deputies, and since 1919 the house was owned by various trade Union bodies. Russian resortsView Chkalov stairs from the river Volga.